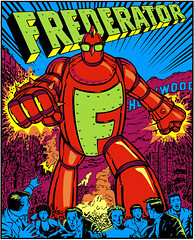 The Frederator Studios Blog: A new gallery. But these graphics seem like a nice way to tell you we're adding galleries to the Frederator website. First up are the neat title cards from My Life as a Teenage Robot. You probably already know the series was created by Rob Renzetti and art directed by Alex Kirwan. But the interesting news is these smart, beautiful, and stunning cards were all designed by Joesph Holt. Click here to take a look at the title card gallery for My Life as a Teenage Robot. I love these title cards from My Life as a Teenage Robot. Really cool. I like see more cards from the episodes! Thanks Kevin. We'll get them up as soon as we can. Please note, we've moved our blog to http://newtoons.frederator.com/frederator_studios.